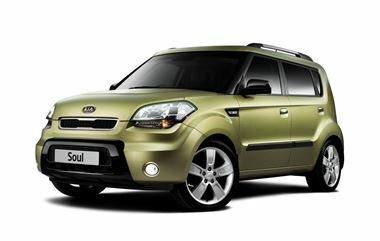 Kia has introduced the Soul Searcher, the latest addition to the Soul 'Originals' line-up - a collection of distinctive versions each designed to have their own 'personality. It follows on from other ‘Originals' such as the Burner, Shaker, Tempest and Echo and goes on sale from 4th January 2011 priced at £16,965 on the road for the manual version and £18,025 for the automatic. As well as the unusual paintwork the exterior features reversing sensors, front fog lights, electric folding door mirrors and privacy glass. Inside there is dual-zone air conditioning, heated front seats, an upgraded eight-speaker sound system (with subwoofer and external amplifier), Bluetooth and iPod connectivity. For the driver a tilt and telescopic steering wheel with cruise control and steering wheel mounted audio controls means that everything is available at close hand. The Soul Searcher is powered by the 1.6-litre CRDi diesel engine and is available in either five-speed manual or four-speed automatic. Its occupants are protected by a host of safety features including six airbags, Electronic Stability Control (ESC), Electronic Brakeforce Distribution (EBD), Traction Control (TC) and a five-star Euro NCAP rating.